You will be picked up from local accommodation in the Rivergum Shuttle Bus between 8.15am - 8.30am and depart Waikerie riverfront on board Qatar at 9.00am. Enjoy a leisurely cruise downstream through Lock 2, seeing majestic limestone cliffs, wildlife, local vineyards and the old distillery. Relax with a complimentary tea or coffee and a local gourmet platter on board while cruising down the smooth waters of the Murray River. After seeing the Lock in action, the cruise will continue to Caudo Vineyard where you will disembark at approx. 1.00pm. 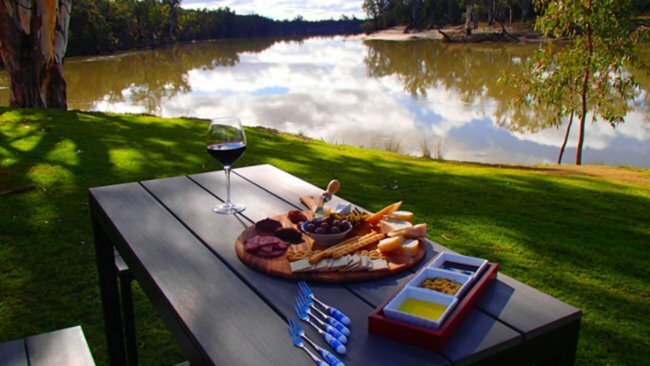 On arrival there will be free wine tasting, whilst overlooking the beautiful Murray River. Feel free to purchase the local tasting platter and the BBQ Grill for lunch while you try the Caudo’s famous Sangria, then turn your own meat on the BBQ and cook to your liking. You will depart Caudo’s at approx 4pm and be transported back to Waikerie on the Rivergum Shuttle Bus and returned to your accommodation.